The most important thing to share right now is that I don't have any significant news to share about Mini Six Revised. Last year, I made an attempt at finally doing it, and it turned into another project completely, so far removed from Mini Six that it's something else entirely. I don't think the world really needs another multi-purpose RPG engine right now, at least not by me, so I shelved that and started over. And every time I get to work on Mini Six, I end up right back at that unintentional diversion again and again, like it's a magnet that keeps drawing me in. I still have cognitive issues which means that I work slowly. For those who used to spot me elsewhere on the internet, you may have noticed my greatly reduced presence. It's not like I have nothing done for Mini Six, but it's far from being enough to justify a new edition right now. The rest of this is personal, so feel free to skip it. Most important is a family emergency which has me concerned. Last week my dad appeared to have a heart attack. A week-long visit to the hospital uncovered a deeper problem - non small cell lung cancer. We're still waiting on the final staging diagnosis, but it's highly likely to already be stage IV. He's uninsured so we've got challenges ahead of us that I can't fathom yet. If you smoke, stop now. I know you've heard it a million times in your life, and I know it's hard to quit. Please believe me, in what I've seen in just the last week and what I understand of what's coming, you don't want to go through it or put anyone else through watching you go through it and being unable to stop it. I expect to be very busy elsewhere for some undetermined amount of time, then when I'm not "busy," it will be an even darker time. So I don't know what to expect. I don't know if I'll return to Mini Six Revised first or the other project. I look forward to seeing you're doing with Mini Six and OpenD6 in general. I accidentally misused the publisher mailing tools at RPGNow. I was trying to send a message to the folks who have Mini Six in their wish list, letting them know about the special discount available until the 28th (see below), and I believe I forgot to check the proper box, meaning that everyone who got a mailing last week got it instead. I'm sorry for that. If I've annoyed you, know that I won't do that again! I didn't intentionally spam your inbox. Mini Six in Print - Finally! Mini Six: Bare Bones Edition is finally available in physical print! This discount expires April 28, 2017. Note that this printed edition is exactly the same as the PDF except a few blank end pages have been added due to the print process. Thanks to everyone who supported me in doing this! Mini Six Revised still lacks a firm commitment. Here's why: I don't want to bite off more than I can chew. The health problems from last year continue to trouble me. It's hard to read and write when recovering from seizures. All that said - for now progress continues, slowly, and without any firm launch date in mind. When I reach the art and layout stage, I'll make the decision whether to proceed with a Kickstarter or self-fund. The black rats under the manor aren't officially recognized by the lord. They've been down there for centuries - awakened long before mousekind, but unable to bear the light of day. The manor was built on ruins of a castle which fell into disuse in the 1350's. The lord of that keep had been a man of learning and an accomplished alchemist. Long exposure to the sorcerer's stone kept in his subterranean laboratory awoke them to full consciousness. Indeed, all of mousekind probably owes the rats a debt, because it was a black rat that intentionally corrupted the experiment of the last human Lord Blythswood using the sorcerer's stone itself - although polite society considers this tale to be a falsehood. The black rats of the under-manor are said to be immortal, to be completely unable to come into the sunlit outdoors, and to be able to wield magic without the use of elixir. 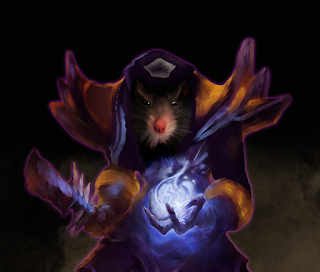 Rumors persist that the ultimate source of all elixir is in their domain, and that at least one group of slavers work exclusively to supply them with the only thing which will sustain them, live mice. Next Update: Mini Six Revised isn't running on a schedule yet. I will update when there's some progress, I have something to show, or in about a month just so you know that there isn't any progress. Hope to see you soon.